These small white turnips are so crisp and have a sweetness to them that they can be enjoyed raw and are often called salad turnips. There is no need to peel them (though you certainly can), simply chop into salads and grate into slaws. They can also be cooked and we recommend roasting as it intensifies the sweetness of the turnip. 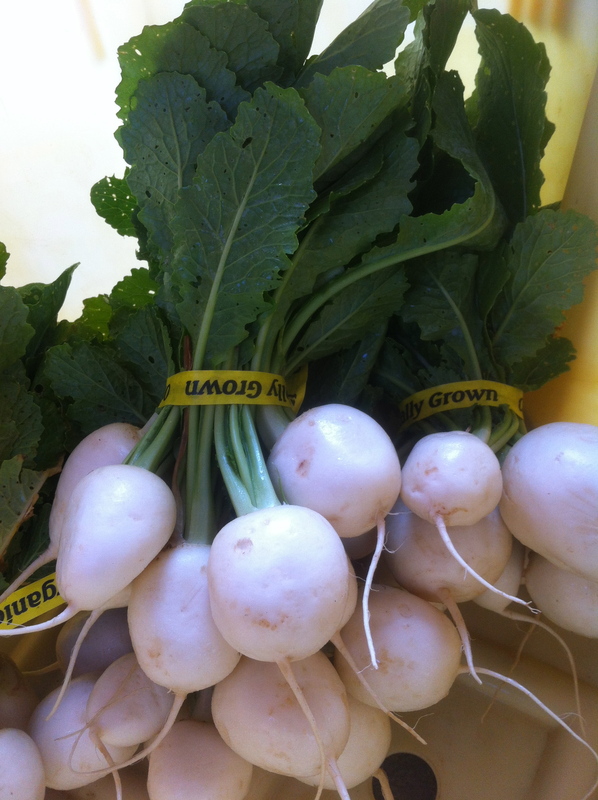 These turnips are not very common in grocery stores so they are a local seasonal treat. They are a relatively new variety developed in Japan in the 1950s to deal with food shortage problems. The turnip itself is very nutritious, but so are the greens, so we recommend cooking them as well. We hope that you enjoy them as much as we do! I am forever looking for turnip recipes. Thanks I will try the honey and wine. This weekend I made turnip paprika soup. This sounds like such a great recipe! Can’t wait to try it!